Sheringham Golf Club, which has introduced gender free tees (Pictures: Leaderboard Photography). 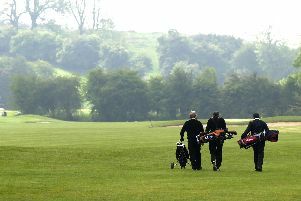 THE DAYS when men and women played golf together but teed off at separate teeing areas could become a thing of the past. A growing number of clubs are abandoning ladies’ and men’s tees and replacing them with tees which any member can play off according to their ability and inclination. Signage at Trentham Park indicating the new set of tees in use. The reasons behind the change include the encouragement of improving golfers, the retention of ageing players and the promotion of social golf. Golfers who find a loss of length with their shots as they age can move to forward tees; improving players can gain an extra challenge by moving back, and social golfers can choose to play together off the same tees. Gender-free tees are common in the USA and the concept is attracting growing attention in the UK. Gemma Hunter, England Golf’s Handicap & Course Rating Manager, said: “It is still very new here, but I know of over 30 courses which have rated at least one course for both genders. Sheringham Golf Club in Norfolk was among the first to introduce gender-free tees, while Trentham Park Golf Club in Staffordshire is the latest to join the trend. Sheringham took the plunge a couple of years ago when it also introduced a new set of forward tees to create an additional, short course. The club now has three sets of tees, all rated for men and women: from blue, the shortest, through to yellow and white. There is a further set of black tees which are rated only for men, on the advice of the ladies’ county association. However, when he proposed the idea at Sheringham the club quickly got behind it, while also creating four academy holes for beginners on the practice ground and allowing the use of buggies in competition. “We have increased participation in our competitions and I believe we have better retention of members. We want people to play and to be part of the club for as long as they can,” said Milton. Trentham Park has abandoned the tee colours traditionally associated with the men’s and women’s game. Now the club has a black course (6,390 yards), blue (6,188), green (5,255) – plus a composite blue/green course measuring 5,694. Each of the four courses has been measured and rated for both men and women, who now have new scorecards, new tee furniture and new signage. There are also white tees, further down the fairways, for junior beginners. One advantage is that the whole club can play together, off all tees, in special competitions, with the next one planned for this month.